And then I do the dishes: Maple Almond Butter - Homemade! I am aware that, as it is mid-December, most bloggers have been working overtime, baking and cooking and writing Christmas-y posts galore, giving everyone tips and tricks and fantabulous recipes to make their holidays easier. And here I am, having not blogged in ages, yes I know, ages, and what do I post? A nut butter recipe. But, hear me out! Not an ordinary, run-of-the-mill-butter-your-toast-and-run nut butter, it's more a sit-down-and-enjoy, how-in-the-world-have-I-survived-without-this nut butter! OK, OK, let me explain a little further how this came about. The fantastic Brilynn of Jumbo Empanadas fame had a giveaway on her blog a few weeks ago, I left a comment and didn't think about it until I got an email, from Brilynn, telling me I had won a 13-cup Kitchenaid food processor!!! So yesterday, I received THE food processor and, of course, all I had time to do was unpack and wash it, set it on the counter and gawk at it as I was already starting on dinner when the doorbell rang. On a side note, that food processor is huge! I've no idea where I'm going to store it. Anyhoo, the first recipe I wanted to make with my new toy was hummus, but, since my cooked chickpeas are still frozen solid, I just had to find something else to do with it. A quick food blog search later, I found this recipe and I just knew I was making this! Maple Almond Butter. Just saying it makes me want to dip a spoon into the jar again! Maple. Almond. Butteeeeeeeeer! It's not just good, it's stellar! I promise, if you have a food processor and have never tried making your own nut butter, take the processor out of it's hiding place, roast some nuts, and get whizzing! Store bought nut butters are always too sweet for my tastes and although this is maple flavored, and the maple does come through loud and clear, it is not overly sweet. The maple flavor compliments the almonds perfectly. My favorite way to eat this is with slices of apples, delicious for breakfast or as a snack. Line a baking sheet with parchment paper. Spread the almonds on the baking sheet and drizzle with the maple syrup giving the almonds a toss to coat them well. Roast the nuts in a 325F oven for about 20 minutes, tossing them once or twice, making sure they don't burn. When the nuts are ready, remove the baking sheet from the oven, place it on a cooling rack and let the almonds cool for a good 20 minutes. Place the almonds in the bowl of your food processor along with a few pinches of fleur de sel and pulse a few times to break up the nuts. Add a teaspoon of oil, scrape the sides of the bowl and pulse again until the nuts break down further. Scrape the bowl and drizzle in some more oil as needed to get a creamy, luscious almond butter. Store in a jar, in the refrigerator. excellent way to break in the prize of all prizes! What a delicious treat! 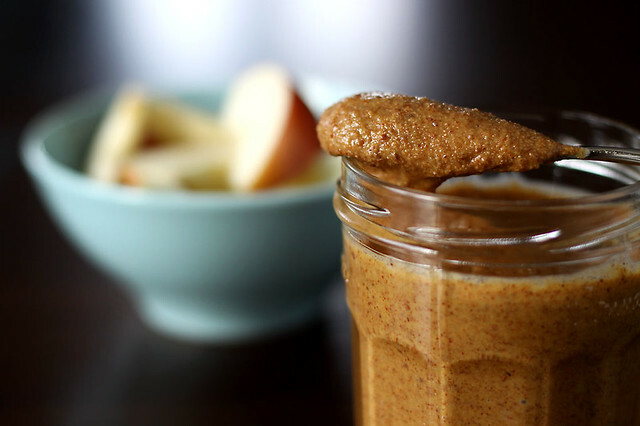 I've been in love with Almond Butter ever since I tried Barney Butter, but this homemade version looks so much better! With a maple bonus! Long time no see you, my lovely friend! I wish you all the best in this year that has just begun. And what a wonderful present you received, congratulations! I just made, today, Maple Almond Butter cookies! Delish! Thanks for the recipe.